The weather has been incredibly perfect lately. 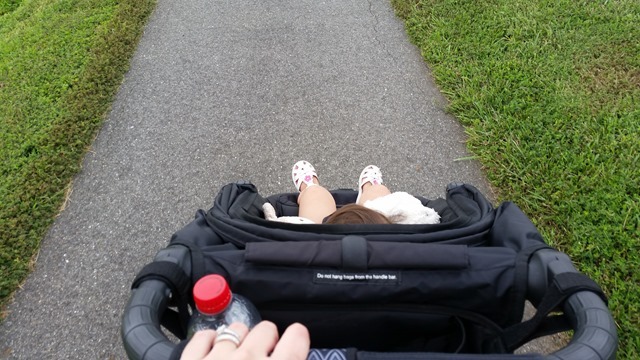 Morning walks are becoming the norm for Sophia and I and she really seems to enjoy them. They break up our mornings since some days she wakes up earlier than others. As picture above entails, she’s also pretty obsessed with bringing all of her favorite animals with us, everywhere. 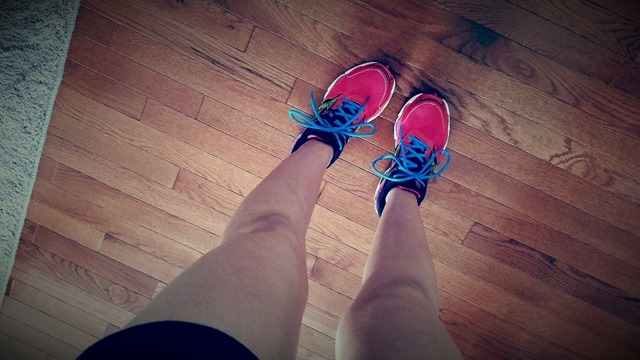 I’m really starting to get on the healthy exercise train since the weather is cooling down. I hate the heat, so this cool air is welcomed with open arms. I tried Costco’s Spinach, Artichoke + Parmesan dip this weekend and it’s amazing. I don’t have a membership there, but am more than welcome to the idea of it being brought to my doorstep in exchange for other delicious food. Any takers? We took Sophia to a party about an hour away from us in Delaware on Saturday. 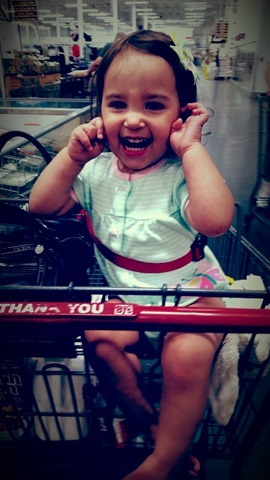 We’re really trying to take her to more places to expose her to different environments. We usually take the babysitter approach, but it seemed fitting to bring her. Important to note: She still won’t sleep anywhere else besides the car, her own crib, or my parent’s house. Double edge sword. So naturally she partied with us until 10:30ish and we headed home. She crashed almost immediately in the car, and transferred smoothly to her crib. Us being the old people we are, followed suit. 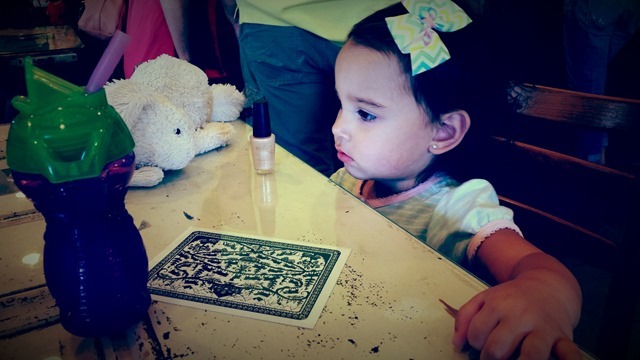 Sophia is obsessed with nail polish. I’ve never put it on her, she just likes carrying the bottles of it around. I took the toy popper out of the closet on Friday, and it will be going back away tonight. So. Much. Popping. It’s soup weather! That means, Kylie makes every soup under the sun, and Sophia eats all of them. Literally, all of them. Fun fact: She can say “Elsa” but still won’t say “Mommy”. Rude. We have VERY busy weekends coming up this fall, so the next couple weekends will be for mentally preparing for all of it. Once we get a break, it’s Thanksgiving, and then Sophia’s 2nd Birthday (holy crap) and then Christmas. My planner wants to catch fire. I still haven’t had Pumpkin anything, and it’s going to stay that way until at least October. I want to paint incredibly bad, but when I actually sit and think about doing it? It can wait until tomorrow. And here’s your dose of Sunday cuteness. You’ll make the food they ask for, and watch them take one bite and sign, “all done”. You will get them dressed, hair brushed, snack + drink ready, for them to run upstairs in protest of getting in the car. You will be subjected to public tantrums and obvious shaming from other “non-parents” for their behavior. I need to remind myself of this every day. Every single day brings struggles. Toddlers are extremely frustrating, loud, loving, cuddly little things. Most of them are bipolar, at least mine is most days. They’re picky eaters, or they just don’t eat in general. 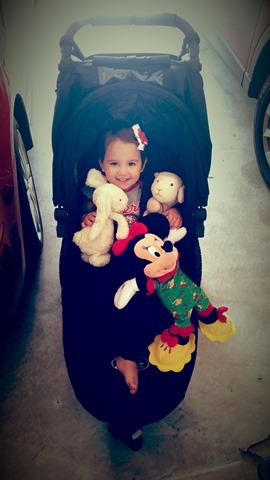 They love the stroller one day, hate the stroller the next day. Nothing is ever the same, and everything changes day-to-day. You never know what kind of day you’re going to have, especially if they wake up on the wrong side of the crib.